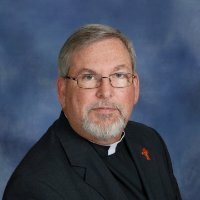 The Reverend Dr. John Michael (“Mike”) Ramey was born in Beaumont, Texas, to John W. and Mary Jo Ramey. Baptized at St. John Lutheran Church in Beaumont, the family shortly thereafter moved to Bay City because of a job transfer, and then to Newgulf, Texas where they would live for many years. Mike was confirmed at St. John Lutheran Church in Wharton, Texas and graduated from Boling High School. He attended Concordia Lutheran College in Austin, Texas, and completed his undergraduate work at Concordia Teachers College in Seward, Nebraska. He received his Master of Divinity from Concordia Seminary in St. Louis, Missouri, and continued into graduate school, receiving his Doctors of Theology in the area of Systematics and Biblical Research from Trinity Theological Seminary in Newburgh, Indiana. While at Concordia, Seward, Mike met, courted, and married Laura Lee (nee Heerten) in August of 1980. God has blessed them with four children and five grandchildren who are scattered across the country. Mike and Laura have their permanent home in Conover, North Carolina, where they intend to retire. Mike served his vicarage year as a church planter in northern Minnesota where he helped to establish Shepherd of the Lake Lutheran Church in Garrison, Minnesota. His initial call from the seminary was to serve as pastor to Trinity and Zion Lutheran Churches in Campbell and Upland, Nebraska (1984-87). He was called to “re-start” what was Risen Savior Lutheran Church in Lincoln, Nebraska (1987-91). Following activation for Operation Desert Shield/Desert Storm, he was called by the Texas District of The Lutheran Church-Missouri Synod to plant what would become The Family of Faith Lutheran Church in Houston, Texas. He would serve there for a little over seventeen years (1991-2008). He was called to serve as the Senior Pastor of St. Matthew Lutheran Church in Bel Air, Maryland (2008-2014) and most recently served as Senior Pastor at Bethel Lutheran Church in rural Claremont, North Carolina (2014-2019) before accepting the call to serve as Intentional Interim Pastor at Resurrection Lutheran Church in Newport News, Virginia. In addition to his pastor ministry, Mike served as a Chaplain in the Army National Guard in Nebraska (1987-91) and in Texas (1991-95) before entering in the Individual Ready-Reserve (1996-97). He resigned his commission at the end of 1997. He further served The Lutheran Church-Missouri Synod as a circuit Youth advisor, circuit LWML counselor, circuit counselor in both the Texas and Southeastern District, chairman of numerous mission societies, an adjunct professor for Concordia University in Texas, chairman of the 2000 Texas District Pastors Conference and chairman of the 2007 LCMS Synodical Convention in Houston, Texas.